Best of the (Old) West - Welcome to Our Generation USA! YouTube Video of the Movie Trailer for "The Good, the Bad, and the Ugly"
Click here for a List of Western Television Series. Click here for a List of Western Movies. Cowboys and gunslingers typically wear Stetson hats, bandannas, spurs, cowboy boots and buckskins. Recurring characters include the aforementioned cowboys, Native Americans, bandits, lawmen, bounty hunters, outlaws, soldiers (especially mounted cavalry, such as buffalo soldiers), and settlers (farmers, ranchers, and townsfolk). The ambience is usually punctuated with a Western music score, including American and Mexican folk music such as country, Native American music, New Mexico music, and rancheras. Westerns often stress the harshness of the wilderness and frequently set the action in an arid, desolate landscape of deserts and mountains. Often, the vast landscape plays an important role, presenting a "...mythic vision of the plains and deserts of the American West". Specific settings include ranches, small frontier towns, saloons, railways and isolated military forts of the Wild West. 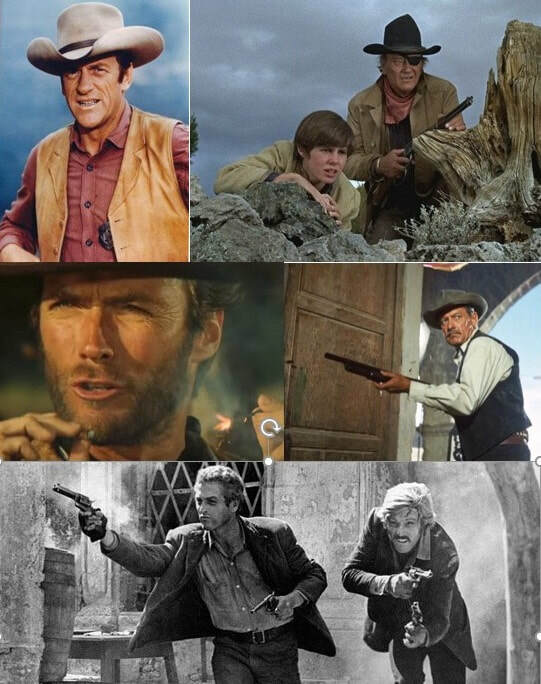 The Western was the most popular Hollywood genre from the early 20th century to the 1960s. Western films first became well-attended in the 1930s. John Ford's landmark Western adventure Stagecoach became one of the biggest hits in 1939 and it made John Wayne a mainstream screen star. Westerns were very popular throughout the 1950s and 1960s. Many of the most acclaimed Westerns were released during this time, including High Noon (1952), Shane (1953), The Searchers (1956), and The Wild Bunch (1969). Classic Westerns such as these have been the inspiration for various films about Western-type characters in contemporary settings, such as Junior Bonner (1972), set in the 1970s, and The Three Burials of Melquiades Estrada (2005), set in the 21st century. The Western genre sometimes portrays the conquest of the wilderness and the subordination of nature in the name of civilization or the confiscation of the territorial rights of the original, Native American, inhabitants of the frontier. The Western depicts a society organized around codes of honor and personal, direct or private justice–"frontier justice"–dispensed by gunfights. These honor codes are often played out through depictions of feuds or individuals seeking personal revenge or retribution against someone who has wronged them (e.g., True Grit has revenge and retribution as its main themes). This Western depiction of personal justice contrasts sharply with justice systems organized around rationalistic, abstract law that exist in cities, in which social order is maintained predominately through relatively impersonal institutions such as courtrooms. The popular perception of the Western is a story that centers on the life of a semi-nomadic wanderer, usually a cowboy or a gunfighter. A showdown or duel at high noon featuring two or more gunfighters is a stereotypical scene in the popular conception of Westerns. In some ways, such protagonists may be considered the literary descendants of the knight errant which stood at the center of earlier extensive genres such as the Arthurian Romances. Like the cowboy or gunfighter of the Western, the knight errant of the earlier European tales and poetry was wandering from place to place on his horse, fighting villains of various kinds and bound to no fixed social structures but only to his own innate code of honor. And like knights errant, the heroes of Westerns frequently rescue damsels in distress. Similarly, the wandering protagonists of Westerns share many characteristics with the ronin in modern Japanese culture. The Western typically takes these elements and uses them to tell simple morality tales, although some notable examples (e.g. the later Westerns of John Ford or Clint Eastwood's Unforgiven, about an old hired killer) are more morally ambiguous. Westerns often stress the harshness and isolation of the wilderness and frequently set the action in an arid, desolate landscape. Western films generally have specific settings such as isolated ranches, Native American villages, or small frontier towns with a saloon. Often times, these settings appear deserted and without much structure. Apart from the wilderness, it is usually the saloon that emphasizes that this is the Wild West: it is the place to go for music (raucous piano playing), women (often prostitutes), gambling (draw poker or five card stud), drinking (beer or whiskey), brawling and shooting. ​In some Westerns, where civilization has arrived, the town has a church, a general store, a bank and a school; in others, where frontier rules still hold sway, it is, as Sergio Leone said, "where life has no value". ​The American frontier comprises the geography, history, folklore, and cultural expression of life in the forward wave of American expansion that began with English colonial settlements in the early 17th century and ended with the admission of the last mainland territories as states in 1912. "Frontier" refers to a contrasting region at the edge of a European–American line of settlement. American historians cover multiple frontiers but the folklore is focused primarily on the conquest and settlement of Native American lands west of the Mississippi River, in what is now the Midwest, Texas, the Great Plains, the Rocky Mountains, the Southwest, and the West Coast. In 19th- and early 20th-century media, enormous popular attention was focused on the Western United States in the second half of the 19th century, a period sometimes called the "Old West" or the "Wild West". Such media typically exaggerated the romance, anarchy, and chaotic violence of the period for greater dramatic effect. This eventually inspired the Western genre of film, which spilled over into comic books, and children's toys, games and costumes. This era of massive migration and settlement was particularly encouraged by President Thomas Jefferson following the Louisiana Purchase, giving rise to the expansionist philosophy known as "Manifest destiny". As defined by Hine and Faragher, "frontier history tells the story of the creation and defense of communities, the use of the land, the development of markets, and the formation of states." They explain, "It is a tale of conquest, but also one of survival, persistence, and the merging of peoples and cultures that gave birth and continuing life to America." Through treaties with foreign nations and native tribes; political compromise; military conquest; establishment of law and order; the building of farms, ranches, and towns; the marking of trails and digging of mines; and the pulling in of great migrations of foreigners, the United States expanded from coast to coast, fulfilling the dreams of Manifest Destiny. Historian Frederick Jackson Turner in his "Frontier Thesis" (1893) theorized that the frontier was a process that transformed Europeans into a new people, the Americans, whose values focused on equality, democracy, and optimism, as well as individualism, self-reliance, and even violence. Thus, Turner's Frontier Thesis proclaimed the westward frontier to be the defining process of American history. As the American frontier passed into history, the myths of the West in fiction and film took a firm hold in the imagination of Americans and foreigners alike. In David Murdoch's view, America is "exceptional" in choosing its iconic self-image: "No other nation has taken a time and place from its past and produced a construct of the imagination equal to America's creation of the West." Indian massacre, list of massacres of Indians by whites and vice versa. Boot Hill: One of the early alternative RPGs from TSR and using a similar system to Dungeons & Dragons. Aces & Eights: Shattered Frontier: an award-winning alternate history western role-playing gaming. Deadlands: an alternate history western horror role-playing game. Dust Devils: a western role-playing game modeled after Clint Eastwood films and similar darker Westerns. The Red Dead series takes place in the days of the Wild West. Revolver focuses on the prime of the American frontier, while its spiritual successors Redemption and Redemption II focus on the waning years of the Western frontier and the introduction of industrialization to the western United States. The Frontier: A Frontier Town Three Months Old by Ward Platt—1908 book on the real West. Free to read and full text search. The Gateway Arch: "Gateway to the West"
Pictured below: "Visiting the Gateway Arch in Downtown St. Louis"
The Gateway Arch is a 630-foot (192 m) monument in St. Louis, Missouri, United States. Clad in stainless steel and built in the form of a weighted catenary arch, it is the world's tallest arch, and the tallest man-made monument in the Western Hemisphere, and Missouri's tallest accessible building. Built as a monument to the westward expansion of the United States, and officially dedicated to "the American people," it is the centerpiece of the Gateway Arch National Park and has become an internationally recognized symbol of St. Louis, as well as a popular tourist destination. The Arch was designed by Finnish-American architect Eero Saarinen in 1947; construction began on February 12, 1963, and was completed on October 28, 1965, for $13 million (equivalent to $77.5 million in 2018). The monument opened to the public on June 10, 1967. It is located at the site of St. Louis's founding on the west bank of the Mississippi River. "Gateway Arch Construction photographs". University of Missouri–St. Louis. Pictured below: What Really Happened at Custer’s Last Stand? The battle, which resulted in the defeat of US forces, was the most significant action of the Great Sioux War of 1876. It took place on June 25–26, 1876, along the Little Bighorn River in the Crow Indian Reservation in southeastern Montana Territory. The fight was an overwhelming victory for the Lakota, Northern Cheyenne, and Arapaho, who were led by several major war leaders, including Crazy Horse and Chief Gall, and had been inspired by the visions of Sitting Bull (Tȟatȟáŋka Íyotake). The US 7th Cavalry, including the Custer Battalion, a force of 700 men led by Lt. Col. George Armstrong Custer, suffered a major defeat. Five of the 7th Cavalry's 12 companies were annihilated and Custer was killed, as were two of his brothers, a nephew and a brother-in-law. The total US casualty count included 268 dead and 55 severely wounded (six died later from their wounds), including four Crow Indian scouts and at least two Arikara Indian scouts. Public response to the Great Sioux War varied in the immediate aftermath of the battle. Custer's widow soon worked to burnish her husband's memory, and during the following decades Custer and his troops came to be considered iconic, even heroic, figures in American history, a status that lasted into the 1960s. The battle, and Custer's actions in particular, have been studied extensively by historians. Map of Battle of Little Bighorn, Part III. Map of Battle of Little Bighorn, Part IV. Indians. Map of Battle of Little Bighorn, Part V.
Map of Battle of Little Bighorn, Part VI. Map of Battle of Little Bighorn, Part VII. Custer's Last Stand. Map of Indian battles and skirmishes after the Battle of Little Bighorn. 1876–1881. An eyewitness account by Tantanka Iyotake (Lakota Chief Sitting Bull), New York Times archive pdf. Friends Of The Little Bighorn Battlefield – Battle information, including names of 7th Cavalry soldiers and warriors who fought in the battle. The Battle of the Alamo (February 23 – March 6, 1836) was a pivotal event in the Texas Revolution. Following a 13-day siege, Mexican troops under President General Antonio López de Santa Anna launched an assault on the Alamo Mission near San Antonio de Béxar (modern-day San Antonio, Texas, United States), killing the Texas defenders. Santa Anna's cruelty during the battle inspired many Texans—both Texas settlers and adventurers from the United States—to join the Texas Army. Buoyed by a desire for revenge, the Texans defeated the Mexican Army at the Battle of San Jacinto, on April 21, 1836, ending the revolution. Several months previously, Texans had driven all Mexican troops out of Mexican Texas. About 100 Texans were then garrisoned at the Alamo. The Texan force grew slightly with the arrival of reinforcements led by eventual Alamo co-commanders James Bowie and William B. Travis. On February 23, approximately 1,500 Mexicans marched into San Antonio de Béxar as the first step in a campaign to retake Texas. For the next 10 days, the two armies engaged in several skirmishes with minimal casualties. Aware that his garrison could not withstand an attack by such a large force, Travis wrote multiple letters pleading for more men and supplies, but the Texans were reinforced by fewer than 100 men. In the early morning hours of March 6, the Mexican Army advanced on the Alamo. After repelling two attacks, the Texans were unable to fend off a third attack. As Mexican soldiers scaled the walls, most of the Texan soldiers withdrew into interior buildings. Defenders unable to reach these points were slain by the Mexican cavalry as they attempted to escape. Between five and seven Texans may have surrendered; if so, they were quickly executed. Most eyewitness accounts reported between 182 and 257 Texans died, while most historians of the Alamo agree that around 600 Mexicans were killed or wounded. Several noncombatants were sent to Gonzales to spread word of the Texan defeat. The news sparked both a strong rush to join the Texan army and a panic, known as "The Runaway Scrape", in which the Texian army, most settlers, and the new Republic of Texas government fled eastward toward the United States ahead of the advancing Mexican Army. Within Mexico, the battle has often been overshadowed by events from the Mexican–American War of 1846–48. In 19th-century Texas, the Alamo complex gradually became known as a battle site rather than a former mission. The Texas Legislature purchased the land and buildings in the early part of the 20th century and designated the Alamo chapel as an official Texas State Shrine. The Alamo has been the subject of numerous non-fiction works beginning in 1843. Most Americans, however, are more familiar with the myths and legends spread by many of the movie and television adaptations, including the 1950s Disney mini-series Davy Crockett and John Wayne's 1960 film The Alamo. Wyatt Berry Stapp Earp ("Wyatt Earp": March 19, 1848 – January 13, 1929) was an American Old West lawman and gambler in Cochise County, Arizona Territory, and a deputy marshal in Tombstone. He worked in a wide variety of trades throughout his life and took part in the famous Gunfight at the O.K. Corral, during which lawmen killed three outlaw Cochise County Cowboys. Earp is often erroneously regarded as the central figure in the shootout, although his brother Virgil was Tombstone city marshal and deputy U.S. marshal that day and had far more experience as a sheriff, constable, marshal, and soldier in combat. Earp was also a professional gambler, teamster, and buffalo hunter, and he owned several saloons, maintained a brothel, mined for silver and gold, and refereed boxing matches. He spent his early life in Pella, Iowa. In 1870, Earp married Urilla Sutherland who contracted typhoid fever and died shortly before their first child was to be born. During the next two years, Earp was arrested for stealing a horse, escaped from jail, and was sued twice. He was arrested and fined three times in 1872 for "keeping and being found in a house of ill-fame". His third arrest was described at length in the Daily Transcript, which referred to him as an "old offender" and nicknamed him the "Peoria Bummer", another name for loafer or vagrant. By 1874, he arrived in the boomtown of Wichita, Kansas where his reputed wife opened a brothel. On April 21, 1875, he was appointed to the Wichita police force and developed a solid reputation as a lawman, but he was fined and dismissed from the force after getting into a fistfight with a political opponent of his boss. Earp immediately left Wichita, following his brother James to Dodge City, Kansas where he became an assistant city marshal. In the winter of 1878, he went to Texas to track down an outlaw, and he met John "Doc" Holliday whom Earp credited with saving his life. Earp moved constantly throughout his life from one boomtown to another. He left Dodge City in 1879 and moved with brothers James and Virgil to Tombstone, where a silver boom was underway. The Earps clashed with an informal community of outlaws known as the Cowboys. Wyatt, Virgil, and their younger brother Morgan held various law-enforcement positions which put them in conflict with Tom McLaury, Frank McLaury, Ike Clanton, and Billy Clanton who threatened to kill the Earps on several occasions. The conflict escalated over the next year, culminating in the gunfight at the O.K. Corral on October 26, 1881 in which the Earps and Doc Holliday killed three of the Cowboys. In the next five months, Virgil was ambushed and maimed, and Morgan was assassinated. Wyatt, Warren Earp, Doc Holliday, and others formed a federal posse which killed three of the Cowboys whom they thought responsible. Wyatt was never wounded in any of the gunfights, unlike his brothers Virgil and Morgan or his friend Doc Holliday, which only added to his mystique after his death. Earp was a lifelong gambler and was always looking for a quick way to make money. After leaving Tombstone, he went to San Francisco where he reunited with Josephine Earp and she became his common-law wife. They joined a gold rush to Eagle City, Idaho where they owned mining interests and a saloon. They left there to race horses and open a saloon during a real estate boom in San Diego, California. Back in San Francisco, Wyatt raced horses again, but his reputation suffered irreparably when he refereed the Fitzsimmons vs. Sharkey boxing match and called a foul which led many to believe that he fixed the fight. They moved briefly to Yuma, Arizona before joining the Nome Gold Rush in 1899. Earp and Charlie Hoxie paid $1,500 (about $51,000 in 2018) for a liquor license to open a two-story saloon called the Dexter and made an estimated $80,000 (about $2 million in 2017 dollars). The couple then left Alaska and opened another saloon in Tonopah, Nevada, the site of a new gold find. Around 1911, Earp began working several mining claims in Vidal, California, retiring in the hot summers with Josephine to Los Angeles. He made friends among early Western actors in Hollywood and tried to get his story told, but he was only portrayed very briefly in one film produced during his lifetime: Wild Bill Hickok (1923). Click here for more about Wyatt Earp. The Gunfight at the O.K. Corral was a 30-second shootout between lawmen and members of a loosely organized group of outlaws called the Cowboys that took place at about 3:00 p.m. on Wednesday, October 26, 1881, in Tombstone, Arizona Territory. It is generally regarded as the most famous shootout in the history of the American Wild West. The gunfight was the result of a long-simmering feud, with Cowboys Billy Claiborne, Ike and Billy Clanton, and Tom and Frank McLaury on one side and town Marshal Virgil Earp, Special Policeman Morgan Earp, Special Policeman Wyatt Earp (above), and temporary policeman Doc Holliday on the other side. All three Earp brothers had been the target of repeated death threats made by the Cowboys, who objected to the Earps' interference in their illegal activities. The four law men faced five Cowboys. Billy Clanton and both McLaury brothers were killed. Ike Clanton claimed that he was unarmed and ran from the fight, along with Billy Claiborne and Wes Fuller. Virgil, Morgan, and Doc Holliday were wounded, but Wyatt Earp was unharmed. The shootout has come to represent a period of the American Old West when the frontier was virtually an open range for outlaws, largely unopposed by law enforcement officers who were spread thin over vast territories. The gunfight was not well known to the American public until 1931, when Stuart Lake published the initially well-received biography Wyatt Earp: Frontier Marshal two years after Earp's death. The book was the basis for the 1946 film My Darling Clementine, directed by John Ford, and the 1957 film Gunfight at the O.K. Corral, after which the shootout became known by that name. Since then, the conflict has been portrayed with varying degrees of accuracy in numerous Western films and books, and has become an archetype for much of the popular imagery associated with the Old West. Despite its name, the gunfight did not take place within or next to the O.K. Corral, which fronted Allen Street and had a rear entrance lined with horse stalls on Fremont Street. The shootout actually took place in a narrow lot on the side of C. S. Fly's Photographic Studio on Fremont Street, six doors west of the O.K. Corral's rear entrance. Some members of the two opposing parties were initially only about 6 feet (1.8 m) apart. About 30 shots were fired in 30 seconds. Tom and Frank McLaury and Billy Clanton were killed. Ike Clanton subsequently filed murder charges against the Earps and Doc Holliday. The lawmen were exonerated by a local justice of the peace after a 30-day preliminary hearing and then by a local grand jury. Click here for more about the "Gunfight at the O.K. Corral". Daniel Boone (November 2, 1734 [O.S. October 22] – September 26, 1820) was an American pioneer, explorer, woodsman, and frontiersman, whose frontier exploits made him one of the first folk heroes of the United States. Boone is most famous for his exploration and settlement of what is now Kentucky. It was still considered part of Virginia but was on the western side of the Appalachian Mountains from most European-American settlements. As a young adult, Boone supplemented his farm income by hunting and trapping game, and selling their pelts in the fur market. Through this occupational interest, Boone first learned the easy routes to the area. Despite some resistance from American Indian tribes such as the Shawnee, in 1775, Boone blazed his Wilderness Road from North Carolina and Tennessee through Cumberland Gap in the Cumberland Mountains into Kentucky. There, he founded the village of Boonesborough, Kentucky, one of the first American settlements west of the Appalachians. Before the end of the 18th century, more than 200,000 Americans migrated to Kentucky/Virginia by following the route marked by Boone. Boone served as a militia officer during the Revolutionary War (1775–83), which, in Kentucky, was fought primarily between the American settlers and British-allied Indians, who hoped to expel the Americans. Boone was captured by Shawnee warriors in 1778. He escaped and alerted Boonesborough that the Shawnee were planning an attack. Although heavily outnumbered, Americans repelled the Shawnee warriors in the Siege of Boonesborough. Boone was elected to the first of his three terms in the Virginia General Assembly during the Revolutionary War, and he fought in the Battle of Blue Licks in 1782. Blue Licks, a Shawnee victory over the Patriots, was one of the last battles of the Revolutionary War, coming after the main fighting ended in October 1781. Boone remains an iconic figure in American history. He was a legend in his own lifetime, especially after an account of his adventures was published in 1784, framing him as the typical American frontiersman. After his death, he was frequently the subject of heroic tall tales and works of fiction. His adventures—real and legendary—were influential in creating the archetypal frontier hero of American folklore. In American popular culture, he is remembered as one of the foremost early frontiersmen. The epic Daniel Boone mythology often overshadows the historical details of his life. Click here for more about Daniel Boone. ​David "Davy" Crockett (August 17, 1786 – March 6, 1836) was a 19th-century American folk hero, frontiersman, soldier, and politician. He is commonly referred to in popular culture by the epithet "King of the Wild Frontier". He represented Tennessee in the U.S. House of Representatives and served in the Texas Revolution. Crockett grew up in East Tennessee, where he gained a reputation for hunting and storytelling. He was made a colonel in the militia of Lawrence County, Tennessee and was elected to the Tennessee state legislature in 1821. In 1827, he was elected to the U.S. Congress where he vehemently opposed many of the policies of President Andrew Jackson, especially the Indian Removal Act. Crockett's opposition to Jackson's policies led to his defeat in the 1831 elections. He was re-elected in 1833, then narrowly lost in 1835, prompting his angry departure to Texas (then the Mexican state of Tejas) shortly thereafter. In early 1836, he took part in the Texas Revolution and was killed at the Battle of the Alamo in March. Click here for more about Davy Crockett. James Butler Hickok (May 27, 1837 – August 2, 1876), better known as "Wild Bill" Hickok, was a folk hero of the American Old West known for his work across the frontier as a drover, wagon master, soldier, spy, scout, lawman, gunfighter, gambler, showman, and actor. Hickok earned a great deal of notoriety in his own time, much of it bolstered by the many outlandish and often fabricated tales that he told about his life. Some contemporaneous reports of his exploits are known to be fictitious, but they remain the basis of much of his fame and reputation, along with his own stories. Hickok was born and raised on a farm in northern Illinois at a time when lawlessness and vigilante activity were rampant because of the influence of the "Banditti of the Prairie". Hickok was drawn to this ruffian lifestyle and headed west at age 18 as a fugitive from justice, working as a stagecoach driver and later as a lawman in the frontier territories of Kansas and Nebraska. He fought and spied for the Union Army during the American Civil War and gained publicity after the war as a scout, marksman, actor, and professional gambler. Over the course of Hickok's life, he was involved in several notable shoot-outs. Hickok remains a popular figure in frontier history. Many historic sites and monuments commemorate his life, and he has been depicted numerous times in literature, film, and television. He is chiefly portrayed as a protagonist, though historical accounts of his actions are often controversial and most of his career was exaggerated by both himself and various mythmakers. While Hickok claimed to have killed numerous named and unnamed gunmen in his lifetime, according to Joseph G. Rosa, Hickok's biographer and the foremost authority on Wild Bill, Hickok killed only six or seven men in gunfights. Click here for more about Wild Bill Hickok. YouTube Video: "The Making of a Stagecoach Photo Shoot: Building the Coach"
This timeline of the American Old West is a chronology ordered list of events significant to the development of the American West as a region of the United States prior to 1912. The term "American Old West" refers to a vast geographical area and lengthy time period of imprecise boundaries, and historians' definitions vary. The events in this timeline occurred primarily in the contiguous portion of the modern United States west of the Mississippi River, and mostly in the period between the Louisiana Purchase in 1803 and the admission of the last mainland states into the Union in 1912. A small section summarizing early exploration and settlement prior to 1803 is included to provide a foundation for later developments. Rarely, events significant to the history of the West but which occurred within the modern boundaries of Canada and Mexico are included as well. Western North America was inhabited for millennia by various groups of Native Americans, and later served as a frontier to European powers, beginning with Spanish colonization in the 16th century. British, French, and Russian claims followed in the 18th and 19th centuries. After the American Revolution, the newly independent United States began securing its own frontier from the Appalachian Mountains westward for settlement and economic investment by American citizens. The long history of American expansion into these lands has played a central role in shaping American culture, iconography, and the modern national identity, and remains a popular topic for study by scholars and historians. Events listed below are notable developments for the region as a whole, not just for a particular state or smaller subdivision of the region; as historians Hine and Faragher put it, they "tell the story of the creation and defense of communities, the use of the lands, the development of markets, and the formation of states.... It is a tale of conquest, but also one of survival, persistence, and the merging of peoples and cultures." ​​For almost three centuries after Columbus' voyages to the New World, much of western North America remained unsettled by European colonists, despite various territorial claims made by imperialist nations. Europeans interest in the vast territory was motivated by the search for precious metals, especially gold, and the fur trade, with miners, trappers, and hunters among the first people of European descent to permanently settle in the West. The early years were also a period of scientific exploration and survey, such that by 1830 the rough outline of the western half of the continent had been mapped to the Pacific Ocean. The Louisiana Purchase: ​​The Lewis and Clark expedition sets out to explore and chart the territory acquired in the Louisiana Purchase. Carrying word of the fate of the Tonquin to Saint Louis, seven men of the Pacific Fur Company, led by Robert Stuart, become the first European Americans to cross the Continental Divide at South Pass, in present-day Wyoming. Later in the century, the pass will be used by half a million westward migrants as part of the main route of several emigrant trails. ​Congress passes the Missouri Compromise, prohibiting slavery in the unorganized territory north of 36.5° latitude and west of the Mississippi River, except within the boundaries of the proposed state of Missouri, while permitting the admission of Maine as a free state. Largely devised by Henry Clay, it is a landmark agreement in the debate over slavery in the West. Following a 13-day siege, Mexican troops under Santa Anna storm the Alamo Mission in San Antonio, killing all but a handful of its more than 200 Texian defenders, including Jim Bowie and Davy Crockett. Brigham Young and his vanguard company of Mormons first arrive in the Salt Lake Valley in present-day Utah. James W. Marshall discovers gold at Sutter's Mill near Coloma, California, precipitating the California Gold Rush. The United States and Mexico sign the Treaty of Guadalupe Hidalgo, ending the Mexican–American War. The agreement results in the cession of nearly all of the present-day Southwest, including California, to the U.S., as well as the designation of the Rio Grande as the boundary between Texas and Mexico. The phrase "Go West, young man" first appears in an editorial by Indiana newspaper writer John B.L. Soule in the Terre Haute Express. The saying is later popularized by Horace Greeley, editor of the New-York Tribune. The first permanent bridge across the Mississippi River opens for traffic in Minneapolis, Minnesota. Gold is discovered in the Front Range of the Rocky Mountains. The resulting gold rush draws nearly 100,000 people to the Pike's Peak Country of present-day Colorado over the next three years. The Comstock Lode, the first major discovery of silver ore in the country, provokes a silver rush in present-day Nevada that funds boomtowns including Virginia City and Gold Hill. Over the next 30 years, hundreds of mines extract more than $320 million in gold and silver from the region, making millionaires of investors such as George Hearst and the Bonanza Kings. The Pony Express completes its first westbound and eastbound deliveries between St. Joseph, Missouri and San Francisco, California. 250 Confederate troops led by John R. Baylor engage Union forces under Isaac Lynde at Mesilla, New Mexico, resulting in Lynde's troops retreating into the Organ Mountains, toward Fort Stanton. Lynde is relieved of duty after abandoning his post. The first transcontinental telegraph line is completed near Fort Bridger in present-day Wyoming, the result of an effort by Hiram Sibley and Western Union to connect California to the telegraph networks of the east. The ability to instantaneously send messages from coast to coast immediately makes the Pony Express obsolete. The Homestead Act of 1862 is signed into law by President Abraham Lincoln. It aims to encourage settlement in the West by simplifying the process of land acquisition: homesteaders need only claim, occupy for five years, and improve a minimum of 160 acres of unappropriated land to be granted full ownership. Alternatively, settlers have the option of purchasing the land outright after six months of residency. Colonel Kit Carson accepts the surrender of most of the Navajo nation after the final two years of the bloody Navajo Wars. Union General Samuel R. Curtis' Army of the Border decisively defeats Confederate General Sterling Price's Army of Missouri at the Battle of Westport, near Kansas City. The battle ends the last major Confederate offensive west of the Mississippi River. The largest engagement in the Trans-Mississippi Theater, with over 30,000 men involved, it is sometimes called the "Gettysburg of the West". The Battle of Palmito Ranch is fought near Brownsville, Texas. It is the final armed engagement of the American Civil War. Ex-Confederate bushwhackers Frank and Jesse James rob their first bank, the Clay County Savings Association in Liberty, Missouri. Following the completion of the Santa Fe Railroad across the border of the Colorado Territory, the use of the Santa Fe Trail begins to decline, although Dodge City remains a major cattle town for the next decade. The Santa Fe Railroad also completes a rail line at Wichita, Kansas, causing a major population boom in the town over the next several years. Yellowstone is designated America's first national park by President Ulysses S. Grant. The Colt Single Action Army revolver is first manufactured. It later becomes known as "The Gun That Won the West". ​The James–Younger Gang commits the first train robbery in the history of the West by derailing a locomotive of the Rock Island Line west of Adair, Iowa and stealing $3,000 from the express safe and passengers on board. ​An expedition led by Lt. Col. George Armstrong Custer embarks from Fort Abraham Lincoln to explore the previously uncharted Black Hills of present-day South Dakota. The expedition discovers placer gold, prompting a gold rush which draws thousands of settlers to the region over the next few years and thereby antagonizes the native Sioux inhabitants. While leading an attack into a Sioux village in the Montana Territory, the U.S. 7th Cavalry Regiment under Brig. Gen. George Armstrong Custer is ambushed and massacred by over 2,000 Lakota and Cheyenne warriors led by Sitting Bull and Crazy Horse at the Battle of the Little Bighorn (see topic at top of this web page). Billy the Kid is shot and killed by Sheriff Pat Garrett in Fort Sumner, New Mexico. He is buried the next day between his friends Tom O'Folliard and Charlie Bowdre in the town's old military cemetery. The Gunfight at the O.K. Corral takes place in the street behind a saloon in Tombstone, Arizona, pitting the Earps and Doc Holliday against Ike and Billy Clanton, Frank and Tom McLaury, and Billy Claiborne. Billy Clanton and the McLaurys are killed, and Virgil and Morgan Earp, along with Holliday, are wounded. The Northern Pacific Railroad is completed near Independence Creek in western Montana Territory, connecting St. Paul, Minnesota with the Washington Territory. An estimated 50,000 homesteaders rush to claim nearly two million acres of unoccupied land appropriated for public settlement from ceded Native American territory in what is now central Oklahoma. It is the first of several major land runs in the region. Outlaw Butch Cassidy robs his first bank in Telluride, Colorado before fleeing to the remote hideout of Robbers Roost. Data collected for the Eleventh United States Census indicate that the spread of the population into unsettled areas has resulted in the disappearance of the American frontier. The U.S. Census Bureau declares that it will no longer monitor westward migration in the country. In the most violent episode of the Johnson County War, wealthy cattle barons of the Wyoming Stock Growers Association and hired mercenaries invade the Powder River Country to persecute local ranchers on allegations of cattle rustling. A series of deadly stand-offs ensues before President Benjamin Harrison orders the 6th Cavalry Regiment to intervene. The conflict forces a reorganization of the cattle industry in Wyoming and becomes one of the most well-known range wars in the history of the West. ​Butch Cassidy, Elzy Lay, Harvey "Kid Curry" Logan, and Bob Meeks rob a bank in Montpelier, Idaho. Crude oil is discovered for the first time in the Indian Territory, near present-day Bartlesville, Oklahoma. Butch Cassidy and his Wild Bunch rob an Overland Flyer passenger train near Wilcox, Wyoming, resulting in a massive but ultimately futile manhunt. A dust explosion at the Winter Quarters Mine near Scofield, Utah kills at least 200 coal miners in the Scofield Mine disaster, the deadliest mining accident in American history to date. An oil well on the Spindletop dome near Beaumont, Texas strikes crude oil, becoming the first major gusher in the state and triggering the Texas oil boom. Butch Cassidy, Harry Longabaugh, and Etta Place depart the United States for Buenos Aires, Argentina aboard a British steamer. The city of Las Vegas is founded in Nevada. An earthquake and resulting fires devastate the city of San Francisco and neighboring communities, killing at least 3,000 people and leaving nearly three-fourths of the Bay Area's population homeless. Butch Cassidy and the Sundance Kid are reportedly found dead following a shootout with police in the town of San Vicente, Bolivia. New Mexico is admitted as the 47th U.S. state. Arizona is admitted as the 48th U.S. state. It is the last state to be admitted in the contiguous United States, marking the complete political incorporation of U.S. territorial acquisitions west of the Mississippi River. The last stagecoach robbery in American history occurs at Jarbidge Canyon, Nevada, when three robbers hold up a U.S. Post Office Department stagecoach, shoot the driver, and steal $4,000 in cash. The criminals are captured without incident soon after. ​The Spanish missions in California comprise a series of 21 religious outposts or missions established between 1769 and 1833 in today's U.S. State of California. Following long-term secular and religious policy of Spain in Spanish America, the missionaries forced the native Californians to live in settlements called reductions, disrupting their traditional way of life. The missionaries introduced European fruits, vegetables, cattle, horses, ranching, and technology. The missions have been accused by critics, then and now, of various abuses and oppression. In the end, the missions had mixed results in their objectives: to convert, educate, and transform the natives into Spanish colonial citizens. By 1810, Spain's king had been imprisoned by the French, and financing for military payroll and missions in California ceased. In 1821, Mexico achieved independence from Spain, although Mexico did not send a governor to California until 1824, and only a portion of payroll was ever reinstated (ibid.). The 21,000 Mission Indians produced hide and tallow and wool and textiles at this time, and the leather products were exported to Boston, South America, and Asia which sustained the colonial economy from 1810 until 1830, but tended to give British or New England merchant captains importance. The missions began to lose control over land in the 1820s, as unpaid military men unofficially encroached, but officially missions maintained authority over native neophytes and control of land holdings until the 1830s. At the peak of its development in 1832, the coastal mission system controlled an area equal to approximately one-sixth of Alta California. The Alta California government secularized the missions after the passage of the Mexican secularization act of 1833. This divided the mission lands into land grants, in effect legitimizing and completing the transfer of Indian congregation lands to military commanders and their most loyal men; these became many of the Ranchos of California. The surviving mission buildings are the state's oldest structures and its most-visited historic monuments. They have become a symbol of California, appearing in many movies and television shows, and are an inspiration for Mission Revival architecture. The oldest cities of California formed around or near Spanish missions, including the four largest: Los Angeles, San Diego, San Jose, and San Francisco. Orvon Grover "Gene" Autry (September 29, 1907 – October 2, 1998) was an American singer, songwriter, actor, musician and rodeo performer who gained fame as a singing cowboy in a crooning style on radio, in films, and on television for more than three decades beginning in the early 1930s. Autry was the owner of a television station, several radio stations in Southern California, and the Los Angeles/California/Anaheim Angels Major League Baseball team from 1961 to 1997. From 1934 to 1953, Autry appeared in 93 films, and between 1950 and 1956 hosted The Gene Autry Show television series. During the 1930s and 1940s, he personified the straight-shooting hero—honest, brave, and true—and profoundly touched the lives of millions of Americans. Autry was also one of the most important pioneering figures in the history of country music, considered the second major influential artist of the genre's development after Jimmie Rodgers. Autry's singing cowboy films were the first vehicle to carry country music to a national audience. In addition to his signature song, "Back in the Saddle Again", and his hit "At Mail Call Today", Autry is still remembered for his Christmas holiday songs, most especially his biggest hit "Rudolph, the Red-Nosed Reindeer" as well as "Frosty the Snowman", "Here Comes Santa Claus", and "Up on the House Top". Autry is a member of both the Country Music Hall of Fame and Nashville Songwriters Hall of Fame, and is the only person to be awarded stars in all five categories on the Hollywood Walk of Fame, for film, television, music, radio, and live performance. The town of Gene Autry, Oklahoma was named in his honor, as was the Gene Autry precinct in Mesa, Arizona. Click here for more about Gene Autry. YouTube Video: Roy Rogers "A FOUR-LEGGED FRIEND" Trigger "SON OF PALEFACE"
Roy Rogers (born Leonard Franklin Slye, November 5, 1911 – July 6, 1998) was an American singer and actor. He was one of the most popular Western stars of his era. Known as the "King of the Cowboys", Rogers appeared in over 100 films and numerous radio and television episodes of The Roy Rogers Show. In many of his films and television episodes, he appeared with his wife, Dale Evans; his golden palomino, Trigger; and his German shepherd dog, Bullet. His show was broadcast on radio for nine years and then on television from 1951 through 1957. His productions usually featured a sidekick, often Pat Brady, Andy Devine, George "Gabby" Hayes, or Smiley Burnette. In his later years, Rogers lent his name to the franchise chain of Roy Rogers Restaurants. Click here for more about Roy Rogers. Pictured below: ​Since today has unfortunately been dominated by Americans’ obsession with guns and violence, might as well make tonight’s film perhaps the first gun scene ever placed on film, a demonstration by Annie Oakley in 1894. Annie Oakley (born Phoebe Ann Mosey; August 13, 1860 – November 3, 1926) was an American sharpshooter and exhibition shooter. Her talent first came to light when at age 15 she won a shooting match against traveling-show marksman Frank E. Butler, whom she later married. The couple joined Buffalo Bill's Wild West show a few years later. Oakley became a renowned international star, performing before royalty and heads of state. Oakley also was variously known as "Miss Annie Oakley", "Little Sure Shot", "Little Miss Sure Shot", "Watanya Cicilla", "Phoebe Anne Oakley", "Mrs. Annie Oakley", "Mrs. Annie Butler", and "Mrs. Frank Butler". Her death certificate gives her name as "Annie Oakley Butler". Click here for more about Annie Oakley. ​Gunsmoke is an American radio and television Western drama series created by director Norman Macdonnell and writer John Meston. The stories take place in and around Dodge City, Kansas, during the settlement of the American West. The central character is lawman Marshal Matt Dillon, played by James Arness on television. When aired in the UK, the television series was initially titled Gun Law, later reverting to Gunsmoke. The television series ran for 20 seasons from 1955 to 1975, and lasted for 635 episodes. At the end of its run in 1975, Los Angeles Times columnist Cecil Smith wrote: "Gunsmoke was the dramatization of the American epic legend of the west. Our own Iliad and Odyssey, created from standard elements of the dime novel and the pulp Western as romanticized by [Ned] Buntline, [Bret] Harte, and [Mark] Twain. It was ever the stuff of legend." 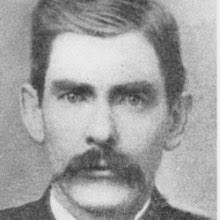 ​John Henry "Doc" Holliday (August 14, 1851 – November 8, 1887) was an American gambler, gunfighter, and dentist, and a good friend of Wyatt Earp. He is best known for his role in the events leading up to and following the Gunfight at the O.K. Corral. He developed a reputation as having killed more than a dozen men in various altercations, but modern researchers have concluded that, contrary to popular myth-making, Holliday killed only one or two men. Holliday's colorful life and character have been depicted in many books and portrayed by well-known actors in numerous movies and television series. At age 21 Holliday earned a degree in dentistry from the Pennsylvania College of Dental Surgery. He set up practice in Atlanta, Georgia, but he was soon diagnosed with tuberculosis, the same disease that had claimed his mother when he was 15, having acquired it while tending to her needs while she was still in the contagious phase of the illness. Hoping the climate in the American Southwest would ease his symptoms, he moved to that region and became a gambler, a reputable profession in Arizona in that day. Over the next few years, he reportedly had several confrontations. While in Texas, he saved Wyatt Earp's life and they became friends. In 1879, he joined Earp in Las Vegas, New Mexico and then rode with him to Prescott, Arizona, and then Tombstone. In Tombstone, local members of the outlaw Cochise County Cowboys repeatedly threatened him and spread rumors that he had robbed a stage. On October 26, 1881, Holliday was deputized by Tombstone city marshal Virgil Earp. The lawmen attempted to disarm five members of the Cowboys near the O.K. Corral on the west side of town, which resulted in the 30-second shootout. Following the Tombstone shootout, Virgil Earp was maimed by hidden assailants and Morgan Earp was murdered. Unable to obtain justice in the courts, Wyatt Earp took matters into his own hands. As the recently appointed deputy U.S. marshal, Earp formally deputized Holliday, among others. As a federal posse, they pursued the outlaw Cowboys they believed were responsible. They found Frank Stilwell lying in wait as Virgil boarded a train for California and killed him. The local sheriff issued a warrant for the arrest of five members of the federal posse, including Holliday. The federal posse killed three other Cowboys during late March and early April 1882, before they rode to the New Mexico Territory. Wyatt Earp learned of an extradition request for Holliday and arranged for Colorado Governor Frederick Walker Pitkin to deny Holliday's extradition. Holliday spent the few remaining years of his life in Colorado, and died of tuberculosis in his bed at the Glenwood Springs Hotel at age 36. Click here for more about "Doc" Holliday. Bartholemew William Barclay "Bat" Masterson (November 26, 1853 – October 25, 1921) was a U.S. Army scout, lawman, professional gambler, and journalist known for his exploits in the 19th-century American Old West. Born to a working-class Irish family in Quebec, Masterson moved to the Western frontier as a young man and quickly distinguished himself as a buffalo hunter, civilian scout, and Indian fighter on the Great Plains. He later earned fame as a gunfighter and sheriff in Dodge City, Kansas, during which time he was involved in several notable shootouts. By the mid-1880s, Masterson moved to Denver, Colorado and established himself as a "sporting man" (or gambler). He took an interest in prizefighting and became a leading authority on the sport, attending almost every important match and title fight in the United States from the 1880s until his death in 1921. He moved to New York City in 1902 and spent the rest of his life there as a reporter and columnist for the New York Morning Telegraph; Masterson's column not only covered boxing and other sports, but frequently gave his opinions on crime, war, politics, and other topics as well. He became a close friend of President Theodore Roosevelt and was one of the "White House Gunfighters" who received federal appointments from Roosevelt, along with Pat Garrett and Ben Daniels. Click here for more about Bat Masterson. YouTube Video: Jesse Woodson James: Outlaw or Hero? Raised in the "Little Dixie" area of western Missouri, James and his family maintained strong Southern sympathies. He and his brother Frank James joined pro-Confederate guerrillas known as "bushwhackers" operating in Missouri and Kansas during the American Civil War. As followers of William Quantrill and "Bloody Bill" Anderson, they were accused of participating in atrocities against Union soldiers and civilian abolitionists, including the Centralia Massacre in 1864. After the war, as members of various gangs of outlaws, Jesse and Frank robbed banks, stagecoaches, and trains across the Midwest, gaining national fame and often popular sympathy despite the brutality of their crimes. The James brothers were most active as members of their own gang from about 1866 until 1876, when as a result of their attempted robbery of a bank in Northfield, Minnesota, several members of the gang were captured or killed. They continued in crime for several years afterward, recruiting new members, but came under increasing pressure from law enforcement seeking to bring them to justice. On April 3, 1882, Jesse James was shot and killed by Robert Ford, a new recruit to the gang who hoped to collect a reward on James' head and a promised amnesty for his previous crimes. Already a celebrity in life, James became a legendary figure of the Wild West after his death. Despite popular portrayals of James as an embodiment of Robin Hood, robbing from the rich and giving to the poor, there is no evidence that he and his gang shared any loot from their robberies with anyone outside their close kinship network. Scholars and historians have characterized James as one of many criminals inspired by the regional insurgencies of ex-Confederates following the Civil War, rather than as a manifestation of alleged economic justice or of frontier lawlessness. James continues to be one of the most iconic figures from the era, and his life has been dramatized and memorialized numerous times. Click here for more about Jesse James. Billy the Kid (born Henry McCarty September 17 or November 23, 1859 – July 14, 1881, also known as William H. Bonney) was an American Old West outlaw and gunfighter who killed eight men before he was shot and killed at age 21. He took part in New Mexico's Lincoln County War, during which he allegedly committed three murders. McCarty was orphaned at age 14. The owner of a boarding house gave him a room in exchange for work. His first arrest was for stealing food at age 16 in late 1875. Ten days later, he robbed a Chinese laundry and was arrested, but he escaped only two days later. He tried to stay with his stepfather, and then fled from New Mexico Territory into neighboring Arizona Territory, making him both an outlaw and a federal fugitive. In 1877, McCarty began to refer to himself as "William H. Bonney". After murdering a blacksmith during an altercation in August 1877, Bonney became a wanted man in Arizona Territory and returned to New Mexico, where he joined a group of cattle rustlers. He became a well-known figure in the region when he joined the Regulators and took part in the Lincoln County War. In April 1878, the Regulators killed three men, including Lincoln County Sheriff William J. Brady and one of his deputies. Bonney and two other Regulators were later charged with killing all three men. Bonney's notoriety grew in December 1880 when the Las Vegas Gazette in Las Vegas, New Mexico, and The Sun in New York City carried stories about his crimes. Sheriff Pat Garrett captured Bonney later that month. In April 1881, Bonney was tried and convicted of the murder of Brady, and was sentenced to hang in May of that year. He escaped from jail on April 28, 1881, killing two sheriff's deputies in the process and evading capture for more than two months. Garrett shot and killed Bonney—aged 21—in Fort Sumner on July 14, 1881. During the following decades, legends that Bonney had survived that night grew, and a number of men claimed to be him. Click here for more about Billy the Kid. 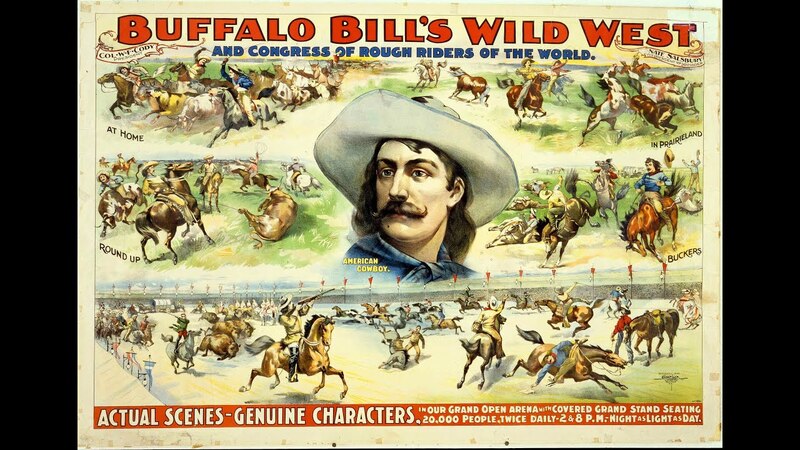 William L. "Buffalo Bill" Brooks (c. 1832 – July 29, 1874) was a western lawman and later outlaw. Brooks was born in Ohio around 1832 where he later became a buffalo hunter in the late-1840s or early-1850s whose success equaled fellow buffalo hunter William F. Cody earning the same nickname of Buffalo Bill. During the late 1860s, Brooks had killed several men in various gunfights, and was briefly hired as a stage driver for the Southwestern Stage Co., before becoming the marshal of Newton, Kansas in 1872. Although he was reported to have been around 40 years old, several biographers have claimed Brooks was in his 20s. With Brooks success in Newton he was soon offered a position in Dodge City as town marshal where he was later involved in 15 gunfights during his first month. In one case one of the men killed had four brothers who came after Brooks in revenge. As the brothers arrived in town Brooks was said to have killed all four men with four shots each. By the following year Brooks had cleared the city of most major criminals. Brooks however killed several men in questionable circumstances including one incident where he killed a man over an argument with a local dance hall girl. After backing down from gunfighter Kirk Jordan, Brooks left town shortly after. According to legend, Brooks went to Butte, Montana where he attempted to become the city marshal but, in part because of Brook's reputation, was instead passed over in favor of Morgan Earp. Confronting Earp over his defeat, Brooks was shot in the stomach and Morgan was shot in the shoulder. Records show however that, shortly after leaving Dodge City, Brooks returned to his old position as a stage driver for the Southwestern Stage Co. in early 1874. Several months later however the company had lost a mail contract to a rival company and Brooks lost his job. In June several mules and horses owned by the rival company had been stolen and Brooks, with two other men, were arrested the next month. It was charged that Brooks had apparently attempted to weaken the rival company and win back the mail contract for the Southwestern Stage Company. Brooks was lynched while awaiting trial on July 29, 1874.